1 Cup Scoop. 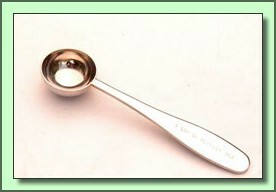 This long handled stainless steel measuring spoon measures 2 grams of whole leaf tea - the perfect amount for 1 cup. It is a perfect complement to the collection of the tea connoisseurs and to the filters advertised above.